When it comes to heavenly flavors, few are as divine as the combination of chocolate and caramel. Our Mini Chocolate Mousse and Caramel Cups deliver this dreamy taste with all the elegance of a five-star restaurant or chic dessert bar. But you won't have to shell out for stuffy ambience just to indulge your sweet tooth - not this time. Now, you can luxuriate in the decadence of fluffy, creamy chocolate mousse and made-from-scratch caramel without leaving the house... or lifting a finger. 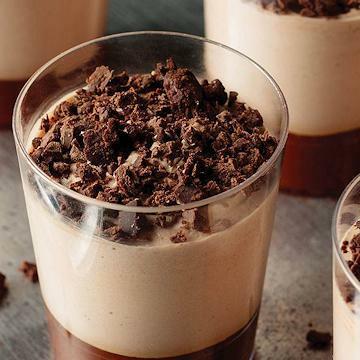 There's a reason chocolate mousse and caramel remains an all-time favorite dessert flavor combination. To live excellently is to indulge exquisitely - and we've made this exquisite indulgence absolutely effortless. No prep, no mess - just take these cups from your freezer, let them thaw, then share with your guestsor savor them for yourself. Also makes a one-of-a-kind gift… order yours now! Thaw in refrigerator for 2 hours.